Beatrice Mary Blackwood was born in 1889 in London. As an undergraduate at Somerville College, Oxford, from 1908-1912, she studied English Literature and Language. She returned to Oxford in 1916 to study for the Diploma in Anthropology, gaining a distinction in 1918. She spent her early career working in the Human Anatomy Department at Oxford, under Arthur Thomson, the Professor of Anatomy. The Department was housed in the Oxford University Museum of Natural History at that time, and both Thomson and Henry Balfour, who was Curator of the Pitt Rivers Museum, had taught Blackwood as part of her Diploma studies. She began working as Thomson's research assistant in 1918 and became Departmental Demonstrator two years later, a position which involved teaching physical anthropology to students, as well as researching and cataloguing the anatomy collections. In 1924 Blackwood was awarded a Laura Spelman Rockefeller Fellowship and travelled to North America. Over the next three years she journeyed across the United States and Canada gathering anthropometric data from African-American, Native American, Asian and white communities. Her work contributed to a survey being carried out by the National Research Council. She also collected a number of objects for the Pitt Rivers Museum while she was away. Back in Oxford, in 1928, she was promoted to University Demonstrator in the Human Anatomy Department. 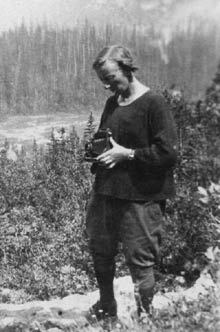 However, in 1929 she set out on another field trip, this time to New Guinea with funding from the National Research Council in Washington, D.C. She was away for 18 months, and for much of that time she was based in the Northern Solomon Islands, on the islands of Buka and Bougainville, where she studied every aspect of local life and built up a large collection of objects, over 400 of which were donated to the Pitt Rivers Museum when she got back to Oxford. In 1935 she published this research in the book 'Both Sides of Buka Passage'. In 1936, changes in the staffing structure of the Human Anatomy Department following the death of Arthur Thomson in 1935 meant that Blackwood was transferred to the Pitt Rivers Museum as University Demonstrator in Ethnology. Her move coincided with her second field trip to Melanesia. This time she was travelling under the auspices of the Pitt Rivers Museum to gather material for the collections. She worked amongst the Anga people in the mountainous region above the Papuan Gulf, before moving on to collect material from the Arawe in south-west New Britain, and finally working in the Madang district on the north coast of New Guinea. As a result of this trip well over 2,000 objects were accessioned into the collections at the Pitt Rivers Museum. Less than a year after her return to Oxford in 1938, Henry Balfour died and Blackwood was left to run the Pitt Rivers with her friend and colleague Tom Penniman, who became the Museum's second Curator. Together, and with the help of a number of Museum volunteers, they began to systematize the Museum's accession records, creating a card-catalogue with entries for every single object in the collection. In 1970, at the request of visiting researchers, she published 'The Classification of Artefacts in the Pitt Rivers Museum'. Blackwood continued to teach anthropology and archaeology to generations of Oxford students studying for the Diploma in Anthropology. She was made Lecturer in Ethnology in 1946. She dealt with hundreds of enquiries from researchers, academics, students and members of the public over the years. 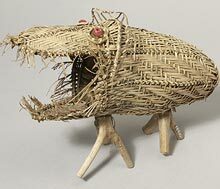 Basketry model of ivuru, collected from Papua New Guinea and donated by Beatrice Blackwood in 1938. Although she never undertook another intensive field research trip, she continued to travel extensively and maintained an impressive correspondence with friends and colleagues throughout the world. She was awarded the Rivers Memorial Medal for her exemplary fieldwork in 1943. She was a member of the Folklore Society Council and the Council for British Archaeology; she became a Fellow of the Society of Antiquaries in 1948, and served as Vice-President of the Royal Anthropological Institute. 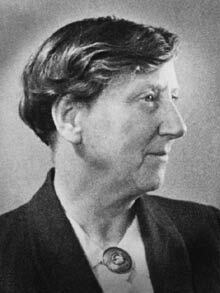 Blackwood became in indispensable member of the Museum's staff, with her encyclopaedic knowledge of the collections. She is remembered as helpful and thoughtful, but she could also be out-spoken and was stickler for correct museological practices and procedures. She commanded great respect, but she was an extremley private person and was happy to work quietly in the background most of the time. She loved her Baby Austin, and only gave up driving when forced to do so after an accident in the mid-1970s. Given Blackwood's fierce independence throughout her life, it is hardly surprising that the loss of her car and consequently her increasing inability to fend for herself in day-to-day life immediately preceded her death in 1975.